Today’s comic stars a very awesome I am ARG reader, Chris Cater. Chris is a talented Toronto based photographer and a burrito lover. Check out his photography work it’s pretty slick! Today’s comic marks the first Guest spot I gave away for the I am ARG! Volume one pre order! There’s just under 10 days left to take advantage of the preorder bonuses like comssioned work and prints of the cover. Did you know if you put gummy bears in a bowl of vodka then put it in the freezer the gummy bear absorb the vodka? Same goes for tampons apparently, but since the are inserted and absorbed through… THE HOLE… it can actually lead to and led to severe alcohol poisoning and death. I don’t think the freezer is necessary. Though that is one that I haven’t tried. You can also put jolly ranchers (or likely any other hard candy) in vodka and get a sickly syrupy sweet vodka. I think it’s horribly disgusting, everyone else I know loves it. This is crazy alchemy you speak of. 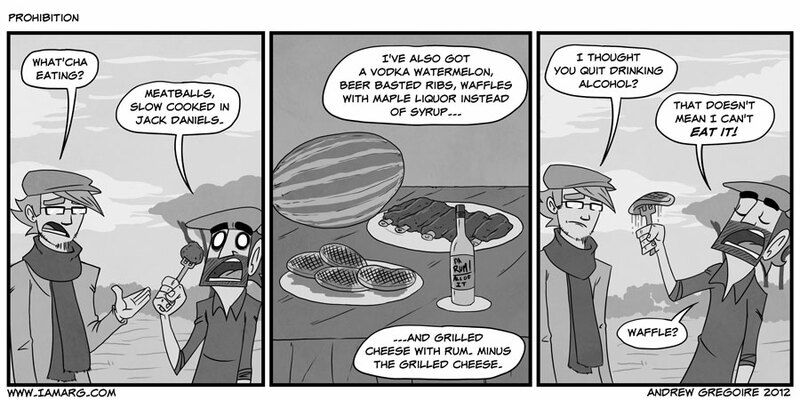 I like the grilled cheese with rum idea. I’ll take it without the grilled cheese as well, please. one hot plate of rum coming right up! I wished I could still remember the last time I had bread pudding. Clever Arg… I might quit drinking now too. That’ll severely hinder your comic. Best cookout ever. You must share your recipes. Cook ribs and waffles. forget to make grilled cheese. fill watermelon with vodka. soak ikea meatballs in jack daniels and smother it all in more alcohol. yeah chris has the same hat only drawn better. My application to the Church of Arg has been mailed.